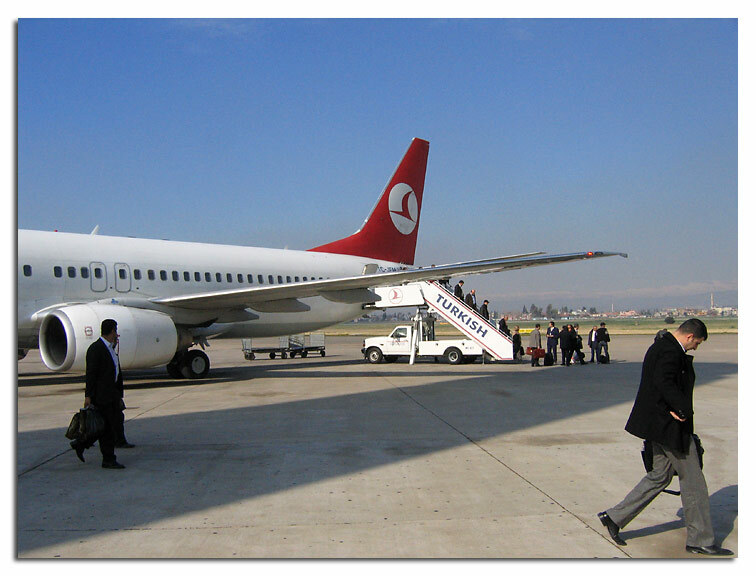 So originally I had this romantic notion that I would fly to Istanbul and continue the journey overland, by bus. However I found out that the bus ride from Istanbul down to Antioch takes the better part of 24 hours and runs about $60 for a ticket. A plane ride takes an hour and a half and cost about $88. So much for romantic notions. A day of travel. 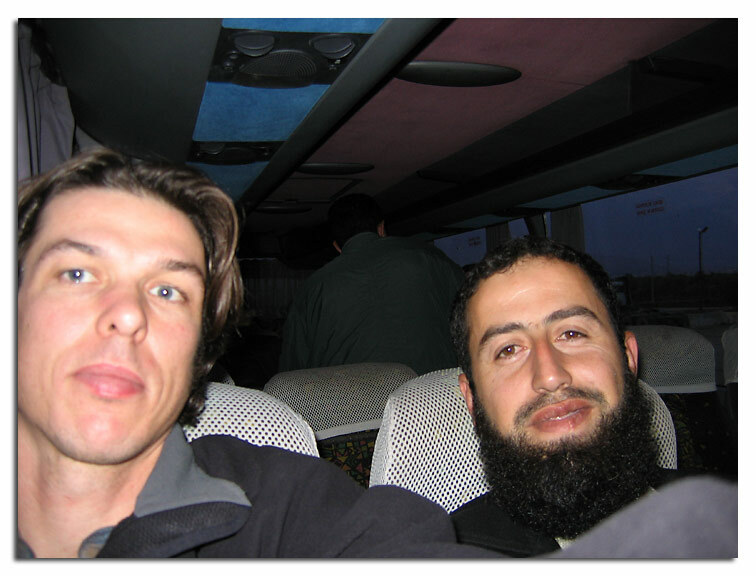 I flew from Istanbul down to Adana, and then commenced riding a series of buses that eventually landed me in Hama. The first bus was a nice luxury Pullman that I took from the Adana Otogar (That's "Bus Station" in Turkish! 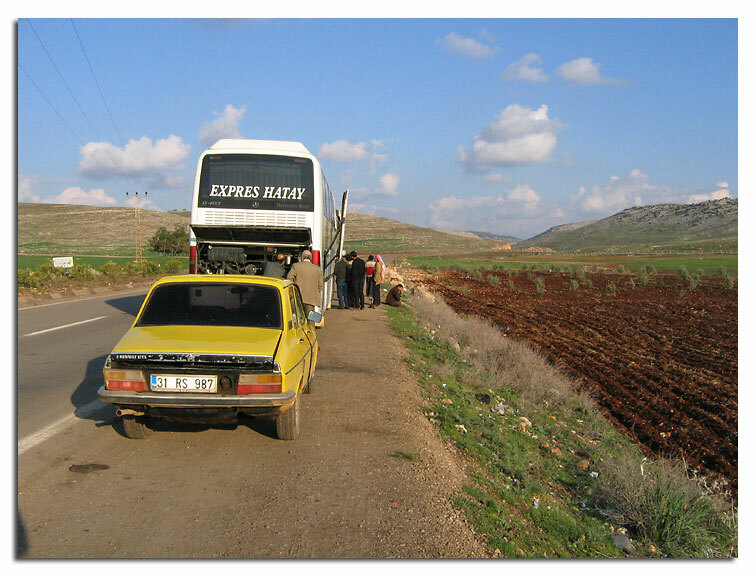 I felt quite proud when I flashed out some of the Turkish Language to the cab driver...) On that bus someone asked me where I was heading and recommended that same bus line for the border crossing. I arrived at the Antioch Otogar and this is where things got a little weird. Speaking none of the language, aside from my prized "otogar" I relied on the conductor to point me straight. He flagged down a guy there and told him my destination, Aleppo, Syria (which, confusingly, is also called Haleb, interchangeably) This gentleman indicated he knew all there was to know about transit to Haleb, he took my passport and asked me to wait, to have tea if I so desired. While I waited I pulled out my map of the Middle East and spread it out on the table in front of me. A guy wandered over and looked at it over my shoulder. He showed me where we were, then narrowed his eyes at the map. I don't know if it is a printing error or what, but there is a funny little tentacle of Turkey that hangs down the Mediterranean Coast into Syria. This chunk of Turkey was colored the same as Syria, even though the border was printed on the map. My new friend jabbed his finger on the map and said "Turkey!!!" he then called over another fellow, and showed him the offending blob of ink. Fellow #2 then jabbed his finger on the offending blob of ink and looked at me and said "Turkey!!!" This process continued until there was a crowd of about 7 people around my map, chattering amongst themselves in unintelligible Turkish. At one point they all stopped talking and regarded me collectively with an exasperated expression. Then they went back to chattering amongst themselves. Soon a dumpy old Minivan pulled up, they type called a service taxi in the Middle East. My passport was transferred to the driver, I was bidden to get in and was whisked off to...nowhere. A muddy alleyway where yet another helpful (but non-English speaking) man had a pile of passports from various men and boys waiting around there. He spent the next hour laboriously recording information from all of these, the rest of the passengers fiddled with the television to get maximize reception of a soccer match, and I cooled my heels. Eventually a bus pulled up, a surprisingly nice one at that. We all trundled out to it and loaded our luggage and then commenced to wait around for another hour or so while various preparations were made to the bus. I began to get to know my fellow travelers. All Syrians, taking a variety of things back across the border. It was their business, cross border importing of various goods. It explained why the hold was filled with so many black plastic bags containing all variety of hidden objects. 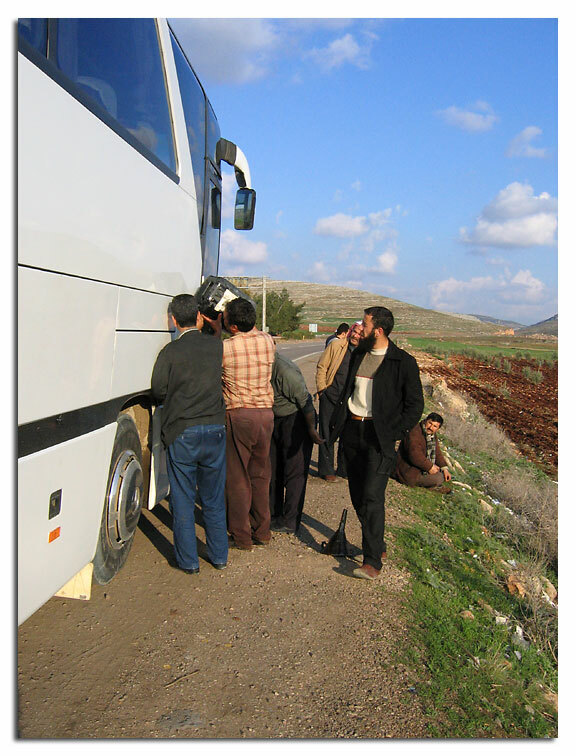 Eventually the door was opened to the bus, we all got on and headed out, across the plains of Antioch and up the hills to the Syrian frontier. The landscape gave way from green lushness to limestone outcroppings. Soon the bus pulled over and we stopped by the highway. Everyone got out and I was made to understand that we were out of gas. I settled in for a long wait, but cell phones are amazing things. In short order an elderly Peugeot pulled up and filled us up with a gallon or two. I scored big points by giving the driver my Turkish Air moist towelette to wipe the diesel off of his hands. Bab al Hawa, the gate between Turkey and Syria, was under construction and there were miles (really, miles of truck lining the highway leading up to the border post) Luckily our bus, due to special regulations (or perhaps the piratical nature I now ascribed to it) Due to the petrol snafu, I and my (by now) companions had arrived at the border right at sunset. I stepped up to the very spartan window (these sorts of places are the same, all over the world) and began the formalities.. I knew it would be fun when they passed me a whole stack of immigration forms through the window. I obligingly filled one out, and it and my passport were summarily carried away, out of the building. After a spell (in which all of my companions finished their business and left me alone in the building) I was presented with another form and told to fill it out again. This was then taken and I was quizzed on my answers. I was then presented with a 3rd form and asked to write just my name on it. Then they asked me what I did for a living. "I have people that work for me and I tell them what to do." <with finality> "You are a teacher! A professor? Yes?" Thusly bringing me to dealing in falsehoods with the nice armed government officials. Somewhere in here I noticed that the bus was no longer there. I quelled a momentary rush of panic with the oddly soothing thought that if the bus had indeed proceeded into Syria with my baggage, there was precious little I could do about it if I did not have permission to enter the country. So it was with a curious logical detachment that I wrote off both the bus and my bag and continued with the grilling at hand. Eventually I received the blessed stamp and the holy tourist card and headed out to see what my prospects were. As luck would have it, the Syrian authorities were in the process of emptying the contents of the bus out onto the highway a few hundred yards down the road, in no man's land. I joined the gathering and a cursory glance did not reveal that my bag was present. "Please, we have enough troubles as it is without you frantically rummaging through the baggage hold while these nice armed men interrogate us." I retreated to the background and eventually we were bidden to get back aboard. We drove into Syria, into Aleppo, into the gathering darkness. A boy hopped into the seat directly in front of me and chattered at me in Arabic. I looked tot he menagerie for help. "He ask 'You no speak Arabic?'" 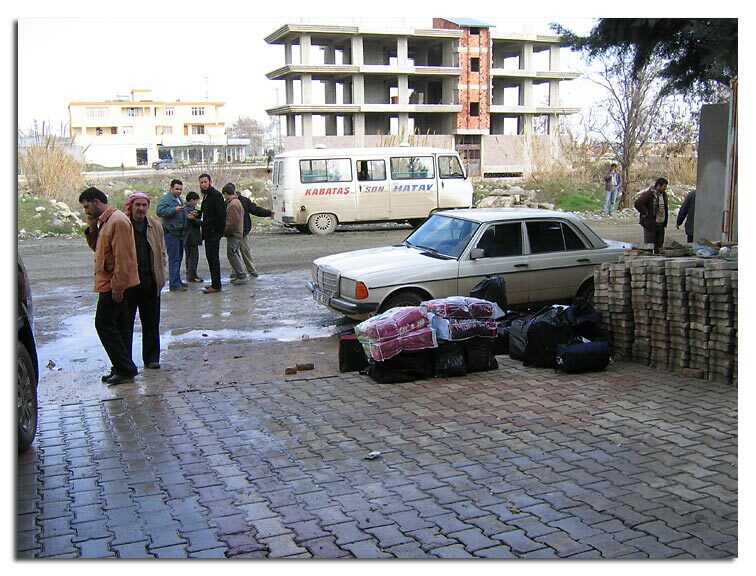 We eventually arrived in Aleppo and (emphasizing to me the piratical nature of our bus) we pulled over to the side of a busy street downtown, not, as one would assume, at a bus station. I shoved into the crowd trying to make sense of approximately 33 billion black plastic bags to see if I could locate my bag. No luck. I crawled around and then back out into the street where the menagerie had gathered to say their good-byes. "We thank you/ Welcome. Have very good business"
"No bag" I said, standing up and cracking my head on the baggage door above me. "Oh, No, is here, I have for you, we put away for Syria, they take things sometimes"
And there, on the curb, it was. 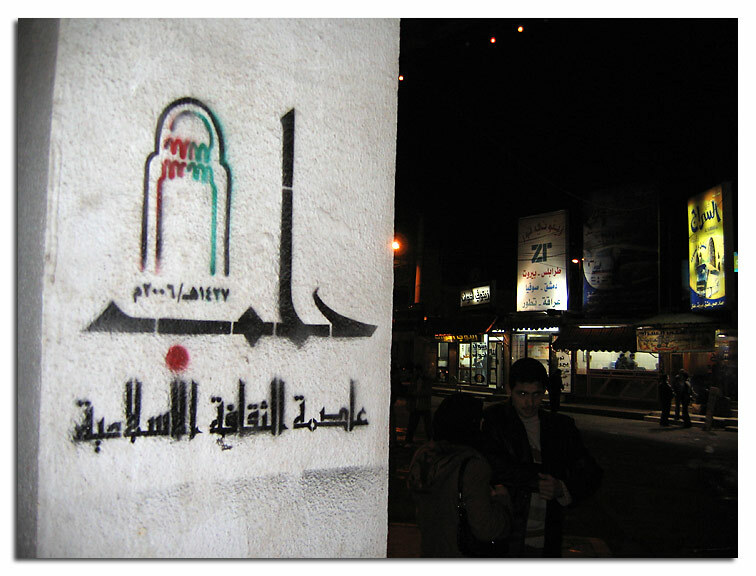 Abdullah, who was going on to Damascus, walked with me to the bus station and made sure I got on the right bus for Hama.